If you’re using Windows XP you might have observed that there’s a file with the name Desktop.ini in some of your folders. You’re sure that you didn’t create such a file but then where did it come from? 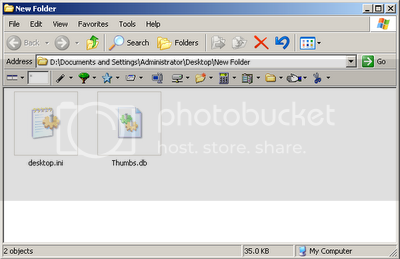 Desktop.ini is a Windows XP system file that stores information about customized folders. If you have customized the display of a folder in any way, Windows saves those settings in a desktop.ini file. Changes may be for instance changing icon, manner of display, etc. Now, Click on the View tab. Check off the radio button next to “Do not show hidden files and folders”. Put a check in the box next to “Hide protected operating system files (recommended)”. That’s it once you have made these changes, Desktop.ini should be out of sight.